In order to help to demonstrate how to steal an API key, I have built and released in Github the Currency Converter Demo app for Android, which uses the same JNI/NDK technique we used in the earlier Android Hide Secrets app to hide the API key. So, in this article you will learn how to setup and run a MitM attack to intercept https traffic in a mobile device under your control, so that you can steal the API key. Finally, you will see at a high level how MitM attacks can be mitigated. In order to perform the MitM attack you need to have mitmproxy installed, have both the computer and the mobile device on the same wifi network, set up the proxy on the mobile device, have a free API key for the third party service that provides the currency rates, and then build and install the Currency Converter demo app on the mobile device. 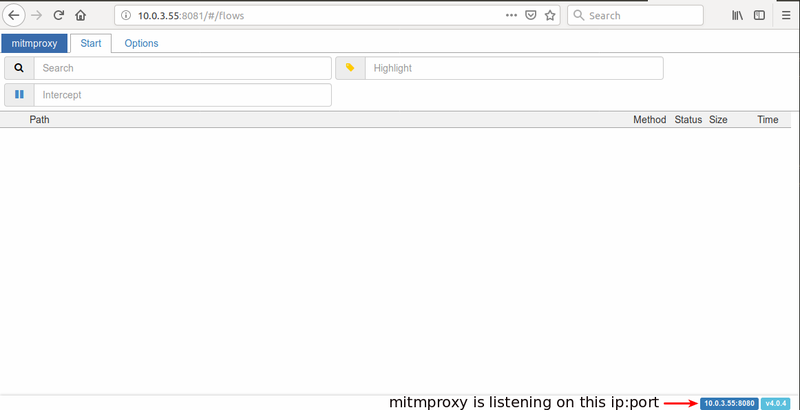 To perform the MitM attack you will use the open source tool mitmproxy which is an interactive https proxy that can be used from the command line or from a web interface, but if you are already using other tools, such as the Charles or Fiddler Proxy, feel free to skip the install and setup for the mitmproxy. # DO NOT FORGET TO RELOAD OR RESTART THE SHELL AFTER ADDING THIS ALIAS FUNCTION. Or you can do it via a bash script somewhere in your bin path with the above function. From now on, any instruction to use the mitmproxy tool will be agnostic with respect to whether you are running it from the official docker image or directly from your operating system. In order to be able to perform the MitM attack you need to connect the computer and the mobile device to the same wifi network. You should take note of the IP address 10.0.3.55 in order to later use it to set up the proxy in the mobile device and to access the mitmproxy web interface. Now that mitmproxy is listening in all traffic that goes through the wifi, on port 8080 (10.0.3.35:8080), it's time to set up our mobile device proxy to send all traffic through it. 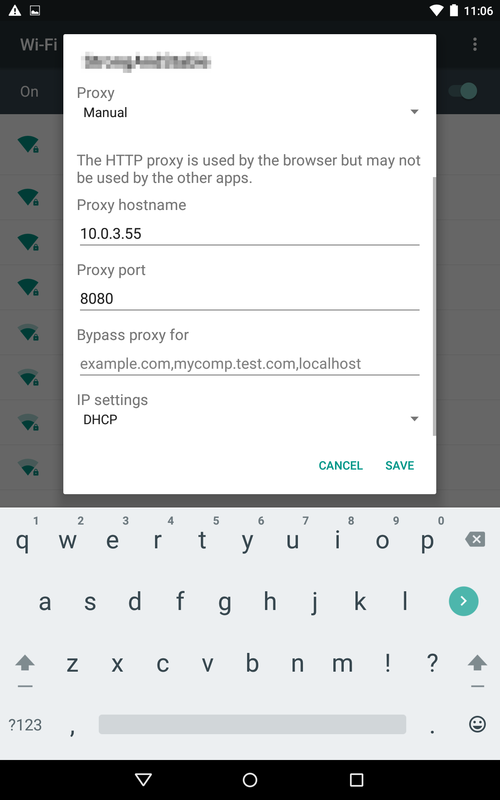 The mitmproxy needs to be launched before you setup the mobile device, because when the mitmproxy web interface starts, a custom authority certificate is auto generated, and it will be later used to setup the proxy on the mobile device. NOTE: If you see any other screen that means the traffic from your mobile device is not being intercepted, thus you need to review the previous steps and ensure that you followed them correctly. Time to click on the Android symbol and install the custom authority certificate for mitmproxy by following the on screen instructions. This will require the mobile device to have authentication enabled when unlocking the screen. If you do not have it done already, you will be prompted to set it up. For this step you first need to get an API key for the third party service that will provide the currency rates used in the mobile app in order to perform the currency conversion. Just visit this page to get your free API key. This was the final step in the setup for the MitM attack, so now we just need to play with the app and watch the mitmproxy web interface for the intercepted requests. Assuming that you still have the mitmproxy running from the setup process, just open the browser on http://your-wifi-ip-here:8081 and start playing with the android app in order to see the API requests being used to get the currency rates from a third party API being intercepted. So let's try to convert £1000 into euros and see if we can intercept and steal the API key when the app calls the third party service to get the currency rate for exchanging pounds for euros. Can you spot where the API key is in the intercepted https request? Congratulations, you have been able to steal the super secret API key that the developer thought to be very well protected. So just to be clear, this is the same API key you copy/pasted into the file app/src/main/cpp/api_key.h and then hid in the mobile app binary through the use of the advanced JNI/NDK technique. This technique makes it difficult to reverse engineer the binary using static analysis, but as you have seen the API key can easily be extracted with a MitM attack. An attacker using a MitM attack to steal an API key can then create huge commercial damage to a company. They can abuse the API resources in the name of the API key owner, thus increasing their usage costs, or they can exfiltrate and exploit the data exposed by the API. What is the difference between https and http requests intercepted by mitmproxy? So can you spot what are the differences between intercepted requests over http and https? Although they look exactly the same, there is a difference - the green bar preceding the https requests. So if until now you thought that https was enough to protect your API key, you may now see that during a MitM attack it does not offer any protection at all. This is possible because of the custom certificate authority we installed on the mobile device when we visited http://mitm.it. Tricking a user into installing this type of custom certificate authority on a device is usually done with fake captive portals to get free wifi in public places, because some users will click on anything just to have free wifi !!! We can mitigate the MitM attack by using certificate pinning on the connection between the mobile app and the API server, and we have an excellent article on it, Hands On Mobile API Security: Pinning Client Connections. Therefore I will not go into detail here, but I want to let you know that pinning can be an operational challenge, and unfortunately it can be bypassed, but if you read this article you will understand how to detect and prevent it from happening. So now you may be wondering what more can be done in terms of mobile API security. I would recommend a deep dive into this series of articles to understand several other security techniques that can be employed to protect a mobile API. While we can use advanced techniques, like JNI/NDK, to hide the API key in the mobile app code, it will not impede someone from performing a MitM attack in order to steal the API key. In fact a MitM attack is easy to the point that it can even be achieved by non developers. We have highlighted some good resources that will show you other techniques to secure mobile APIs, like certificate pinning, even though it can be challenging to implement and to maintain. We also noted that certificate pinning by itself is not enough since it can be bypassed, thus other techniques need to be employed to guarantee that no one can steal your API key, and, if you have completed the deep dive I recommended, you will know by now that in the context of a mobile API, the API key can be protected from being stolen through a MitM attack. So if you have not already done it, please read the articles I linked to in the section about mitigating MitM attacks.